Can you see the differences? We can. The front hood now goes straight down to the bumper, a design trait from the old air-cooled 911s. And your eyes aren’t fooling you; this 911 is definitely a bit wider than it is now. Also take note of the rear end, perhaps the most interesting thing going on here. The lighting design seems to be heavily inspired by what’s found on the Mission-E Concept. The new rear spoiler is also significantly wider, nearly going over the entire rear. Closer inspection from the sides also reveals new door handles. For the record, there are two different test mules pictured here, one likely being the standard S model while the other has the optional sports exhaust system. This is also the first time a 911 is developed to, theoretically, offer a hybrid setup, which will surely happen at some point in this generation’s life. When will it next 911 be revealed? 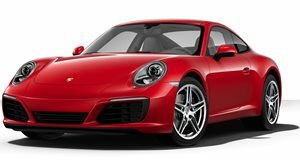 Well, our sources tell us this is a 2019 model, so it’s entirely possible Porsche will debut its all-new 911 at the 2019 Frankfurt Motor Show. Expect to see more (and hopefully more revealing) spy shots up until then as well as additional details about the car’s specifics.